The Brooklyn Botanical Garden set the perfect mood for this chic late fall affair. From the first look, to the evening portraits, the romance between these two was palpable. The bride wore a sleek lace gown, while the groom was dapper in a dark charcoal suit. Situated in central Brooklyn, the gardens have the feeling of being miles away from the city. From the Lily Pool Terrace to the Cherry Esplanade, I scouted out the best backdrops, and captured these timeless looks. Red brick paths and ornate terraces lent classical elements, while the curated foliage gave a more natural, almost rustic look. This photo from a recent Brooklyn Botanical Garden wedding is one of my favorites. The Brooklyn Botanical Garden, founded in 1910, has over 900,000 visitors per year. The 52 acre garden has over 14,000 taxa of plants and is one of the most iconic venues to get married. In the Fragrance Garden, the arching boughs of the topiaries bend over the couple as if to issue a blessing on the newlyweds. The Lily Pool Terrace remains serene while the surrounding cherry trees rustle in the breeze. The Palm House at the Brooklyn Botanical Garden is the perfect spot to host a reception. It allows you to host up to 250 guests. Weddings and events are exclusively catered by Patina Events. The Patina events team has been top notch for the half a dozen weddings I have photographed at the Brooklyn Botanical Garden. The glass walled Palm House at the Brooklyn Botanic Gardens are magical keepsakes. This floor to ceiling glass walls venue is filled with breathtaking flower gardens and has an enchanting aura about it. The building of the Palm House allows couples and their guests to celebrate surrounded by the natural beauty of the gardens, while still enjoying the comforts of being indoors. The Lillian and Amy Goldman Atrium is Brooklyn Botanic Garden's stunning new event space. It is below and ecologically sustainable living roof with native grasses and wildflowers. It is perfect sustainable event space for a wedding or corporate events also run by the Patina Restaurant Group. Any event at Brooklyn Botanic Garden will often show the beauty of the location, but this particular photo is less about the loveliness of the venue and more about the grace of the bride. I love photos that feature the bride and groom engaging with each other. These pictures always have more energy than static, posed photos. To see these two gazing at each other with such joy was a true highlight of the day. And I love the way action photos showcase beautiful gowns. 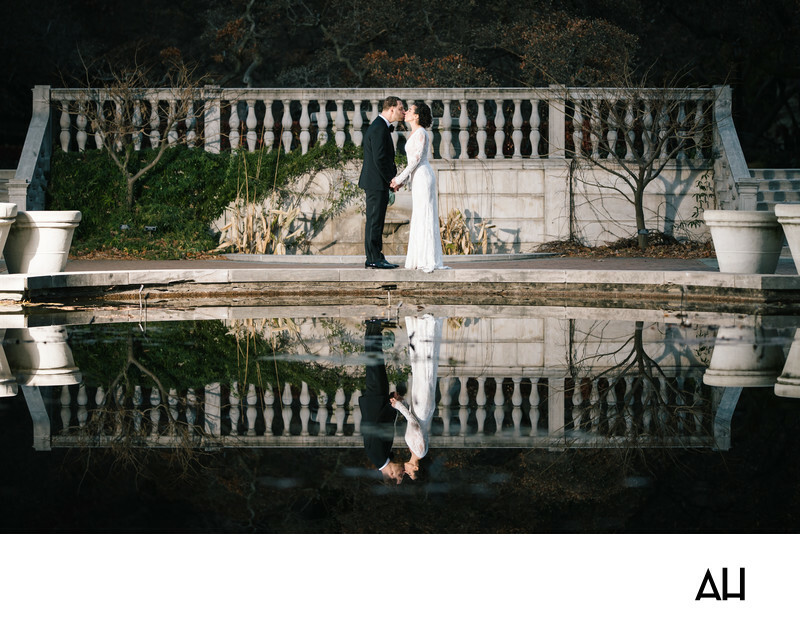 The overcast skies gave us ideal lighting for the Brooklyn Botanical Garden wedding. The Cherry Esplanade is the perfect place to hold a Brooklyn Botanical Garden wedding ceremony. A Brooklyn Botanic Garden wedding allows guests to feel that they are miles away from the busy streets of New York City, without having to travel far. Every season during a Brooklyn Botanic Garden wedding offers something different, from bluebell flowers in the spring to beautiful foliage in the fall. A Brooklyn Botanical Garden wedding cost varies. The view of the gardens are lovely to photograph, and are something couples and their guests will remember for years to come. The pool has a very calming effect on the scene. The allure of the venue’s gardens are not in this image; however, the lush green of the trees surrounding this area can be seen in the reflection of the water. Lily pads float in the pool, and the boy watches for any fish who might swim by. If you need a wedding photographer for your special day that intimately knows the Brooklyn Botanic Garden, please contact me.